The 20015-16 season marks Carl Jeff Bianchi’s twenty-fifth year as the conductor of the American Youth Symphonic Orchestra. 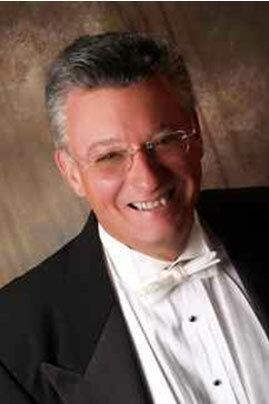 From 1998-2014, Mr. Bianchi was the director of Virginia’s Ambassadors of Music’s summer tour to Europe. A current member of Phi Beta Mu, Mr. Bianchi recently received its Hall of Fame Distinguished Service Award. He’s also a member of the National Band Association (NBA), as well as a past Member-at-Large on the Board of Directors of the NBA. A noted clinician, adjudicator and conductor, Mr. Bianchi was elected to membership in The American Bandmasters Association (ABA) in 1987. He subsequently served on its board of directors, was elected Vice President, and in 2007-2008 served as its President. Mr. Bianchi graduated from the Eastman School of Music in Rochester, New York, where he earned a Bachelor of Music and The Performer’s Certificate in Horn. While attending Eastman, he played solo horn with the Eastman Wind Ensemble under Frederick Fennell and also toured Europe, the Middle East, and the Soviet Union with the Eastman Philharmonia Orchestra under the auspices of the State Department. From 1964-68, Mr. Bianchi played with the US Marine Band, “The President’s Own,” in Washington, DC. He did his graduate work at Catholic University. He has also performed with the National Gallery Orchestra, the Washington Ballet Company Orchestra, and the Washington Opera Society, as well as the Philharmonic Orchestras of St. Louis, Rochester and Buffalo. In 1971, he was a member of the original cast of the world premiere of Leonard Bernstein’s “Mass” at the opening of the John F. Kennedy Center for the Performing Arts.